I have added an addendum to my post that prioritized invasive species. This came from an email that I was sent by Bill McGillvray, a super volunteer at Brooklyn Wildlife Area. His ideas are very good! Here is a link to my revised post. This year we will be sharing summer interns with Rich Henderson and The Prairie Enthusiasts. Recruiting is now underway and detailed information can be obtained from this web site. Briefly, this is a 12 week full-time program, 5 days a week, 8 hours a day, from May 27 through August 16, 2013. The hourly rate is $10.25. Interns will be working at a number of high-quality prairie and oak savanna sites in western Dane County and eastern Iowa County, including Mounds View Grassland, Black Earth Rettenmund Prairie and Pleasant Valley Conservancy. The last two sites are State Natural Areas. 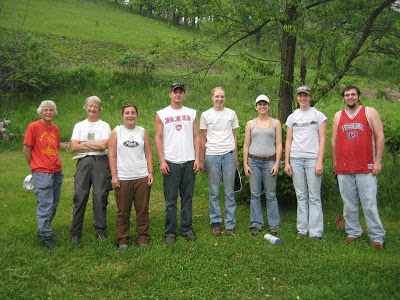 Work is outdoors and involves a number of activities in restoration ecology. Applicants should have a demonstrated interest in environmental conservation. The closing date for applications is February 22, 2013. Interns and regular summer crew at Pleasant Valley Conservancy, 2010. The table below contains only those species that we have to worry about at Pleasant Valley Conservancy or Black Earth Rettenmund Prairie. That's why spotted knapweed and crown vetch don't show up, but if we saw even one of those species we would eradicate it. I apologize for the poor quality of this table. Tables is not Blogger's strong suit. If you have time to fiddle with HTML code you can do a pretty good table, but what you see here is a jpeg that I created from an Excel file. Not everyone may agree with my ratings, but I suspect most people will. One could spend a whole seminar discussing the basis for this table. At any rate, it's a good idea to start planning for the summer now. 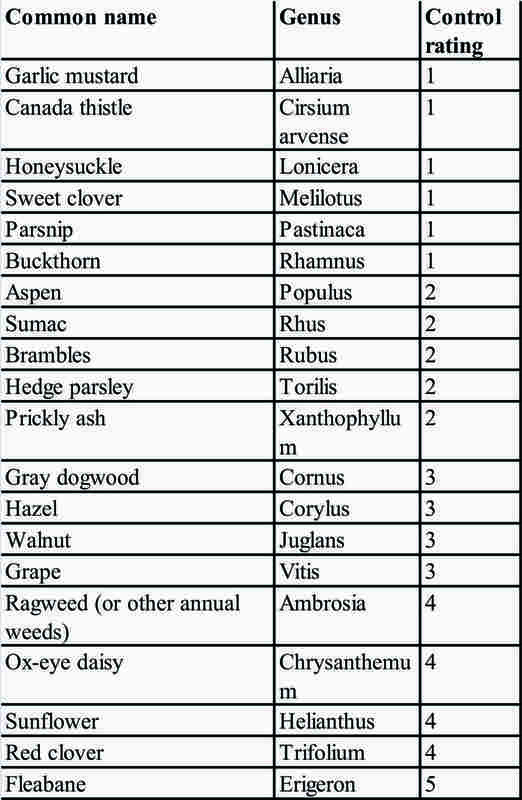 You will note that not all the species in this table are nonnative. However, even native species can be highly invasive, and take over a natural area if not controlled. Sumac and brambles certainly fall into that category. As I noted, the list above is only for species we must deal with at Pleasant Valley Conservancy. 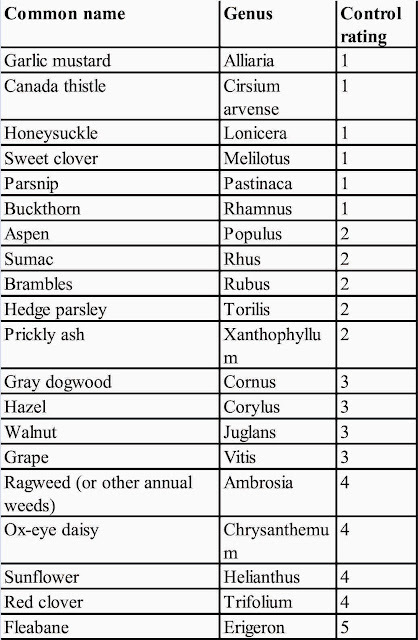 Bill McGillvray, who is a great volunteer at Brooklyn Wildlife Area, sent me the following species that have given him special trouble. I am pasting the substance of his email in here. Thanks, Bill! Reed canary grass. I've spent more time battling RCG than any other. A level 1 plant. Dames rocket. It's shows up here regularly but I nuke it before it seeds out. However west of here in the Brooklyn Wild Area (BWA) and along the Ice Age Trail it's really established and a lot of us think it's on par with garlic mustard. A level 1 plant. Mullein. Wide spread and aggressive around here. A level 2 or 3 plant. 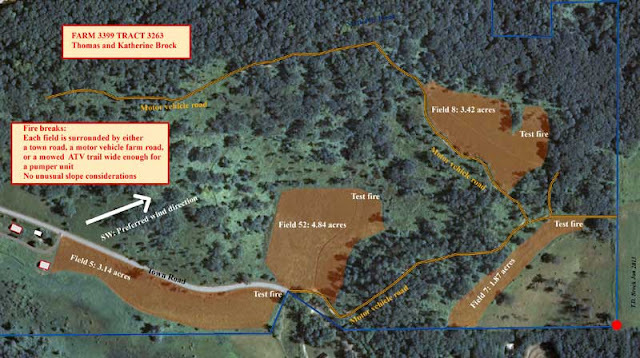 The DNR planted a large area off Bellbrook Road for a little bluestem seedstock nursury. Sadly they didn't control for mullein and it now looks like a cactus field. Russian Olive. Shows up here regularly but firmly established in areas in the BWA. A level 1 plant on par with buckthorn. Queen Ann's Lace One of my most hated plants. I give it a 2 or 3. Multiflora rose. All over around here and seems to be increasing. A level 2. We have very little ag land at Pleasant Valley Conservancy, but what we do have is all planted to prairie. This land has been in the federal Conservation Reserve Program (CRP) since 1987. When we first started with CRP the regulations on prairie maintenance were very loose, but became more precise and restrictive with each ten-year renewal. There were lots of changes in required practices at the time of the last renewal in 2007, most especially on prescribed burning. I believe burning became a major issue because many landowners had not burned and their CRP land was becoming wooded. Now each state has what the USDA calls a "job sheet" dealing with prescribed burning. The Wisconsin one #389 can be reached at this link. Note that prescribed burning is a "required" activity for each field in the CRP once every three years. Since we burned annually, I never worried about the USDA rules, but last week we received a notice from the NRCS (the office responsible for CRP practices) notifying us that we were required to submit a written burn plan for our CRP property. Wisconsin Job Sheet 338 is a detailed form with a lot of blanks to fill in. Among other things, an aerial photo is required that shows the details of the burn (locations of fire breaks and how the burn(s) will be carried out, etc. The map I put together is shown here. The job sheet has a lot of other required information, such as who you are notifying about the burn, who is issuing the permit, what sort of equipment is available (how many drip torches, for instance), the communication plan (how many 2-way radios), what weather conditions would be acceptable for the burn, etc., etc. An upside to these new required practices is that cost-sharing will be provided, so that the whole cost of the burn will not be on the land owner's shoulders.